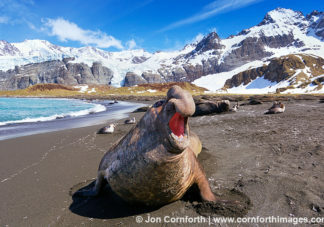 View southern elephant seal photos, license southern elephant seal stock pictures, and buy stunning southern elephant seal prints by award winning professional photographer Jon Cornforth. To license an image for editorial or commercial use, click on the License Image button and fill out the form. To purchase a fine art print, select your image size and presentation style before clicking on the Buy Print button. Elephant seals are large, oceangoing mammals in the genus Mirounga. There are two species: the northern elephant seal (Mirounga angustirostris) and the southern elephant seal (Mirounga leonina). Both were hunted to the brink of extinction by the end of the nineteenth century. However, their numbers have since recovered. The northern elephant seal, somewhat smaller than its southern relative, ranges over the Pacific coast of the USA, Canada, and Mexico. Meanwhile, the southern elephant seal lives in the Southern Hemisphere, on islands such as South Georgia, Macquarie Island, and on the coasts of New Zealand and South Africa. These animals also reside in Argentina in the Peninsula Valds. In fact, that is the fourth largest elephant seal colony in the world. Elephant seals take their name from the large proboscis of the adult males (bulls) which resembles an elephant’s trunk. The bull’s proboscis helps them make extraordinarily loud roaring noises. They especially do this during the mating season. More importantly, the nose acts as a sort of rebreather, filled with cavities designed to reabsorb moisture from their exhalations. This is important during the mating season when the males rarely leave the beach to feed, and therefore must conserve body moisture. Bulls of both the northern elephant seal and the southern elephant seal reach a length of 16ft (5m) and a weight of 6,000lbs (3,000kg), and are much larger than the cows, which typically measure about 10ft (3m) and 2,000lbs (900 kg). While excellent swimmers, they are even more surprising on land. There they display a higher velocity than the average human when moving over sand dunes.